Haemoglobin Meter | products Categories | Electronics India - Manufacturer, Supplier and Exporter of Analytical, Scientific Laboratory and Pharmaceautical Instruments in India. 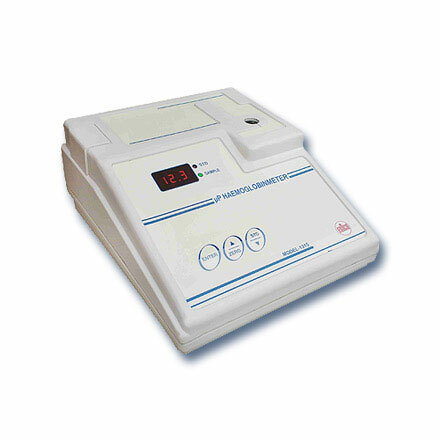 Electronics India is prime Haemoglobin Meter and Photo Colorimeter manufacturers and suppliers from India. Microprocessor Haemoglobin Meter offered by Electronics India is a convenient type of photometer for the evaluation of the Hemoglobin in the blood sample. It is one of the important and easy to use instrument in Blood Analysis. Haemoglobin Meter is the basic instrument used by any pathology laboratory for blood testing.